We know how it feels – when the sun is shining and the humidex is up, your feet are desperate for some fresh air. Hello, flip flop weather! But after a few weeks or months of shuffling around in your skimpy sandals, your feet don’t feel so good. While we appreciate summer footwear as much as the next person, we at Bayview Sheppard RMT also find ourselves treating more cases of plantar fasciitis – flip flop feet – as a result. Summer sandal season’s enemy, plantar fasciitis, is inflammation of your plantar fascia – the thick band of tissue connecting your heel bone to your toes. Without enough foot support, particularly in the arches, the fascia can become strained, leading to severe heel pain. Many may notice that the pain is at its worst when you first wake up in the morning and lessens throughout the day. Once relegated to the beach, flip flops have become a go-to footwear option. We too find ourselves guilty of slipping on our favorite pair on occasion! However, flip flops are one of the leading culprits of many foot conditions, given that they lack significant foot support, inflammation, tendinitis and even bone spurs can occur as a result of wear. If you’re a flip flop wearer, you know the risks, we won’t lecture you. We can, however, help you with the pain and discomfort. 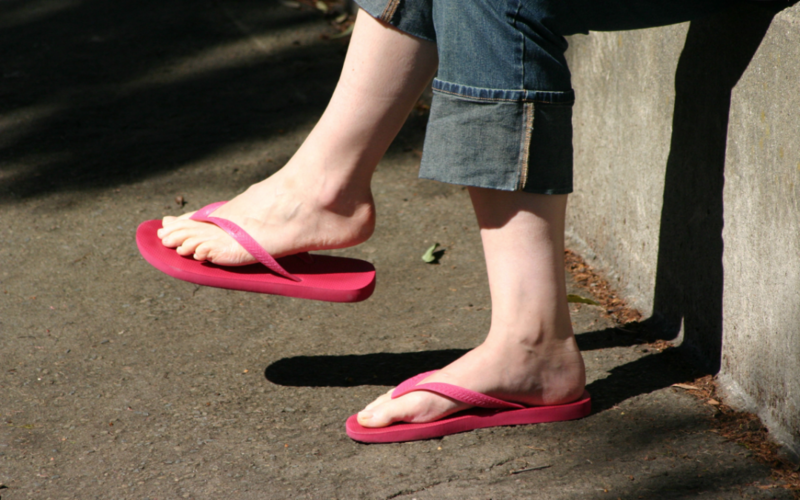 Flip flop feet is a condition that is no stranger to us at Bayview Sheppard RMT. Using deep tissue massage, our RMTs can help focus on the realignment of deeper layers of muscles and connective tissues. Specifically, applying deep pressure on the fascia, Achilles heel, and calf muscles has been proven to release the muscle tension thereby managing the pain. While this treatment may make the area feel tender at first, with regular sessions it will improve. Slip on a pair of sandals with some support and step into our North York clinic. While pain alleviation may be your end goal, our RMT’s techniques also promote muscle relaxation, improve circulation, and relieve stress. Welcome back happy feet and pain-free mobility! Bayview Sheppard RMT is a massage therapy clinic located in North York, Toronto, open 7 days a week. We offer treatments specifically based around plantar fasciitis, pregnancy and prenatal massage, sports massage, deep tissue massage, Thai massage, couples massage, and much more. Email or call us today to book.